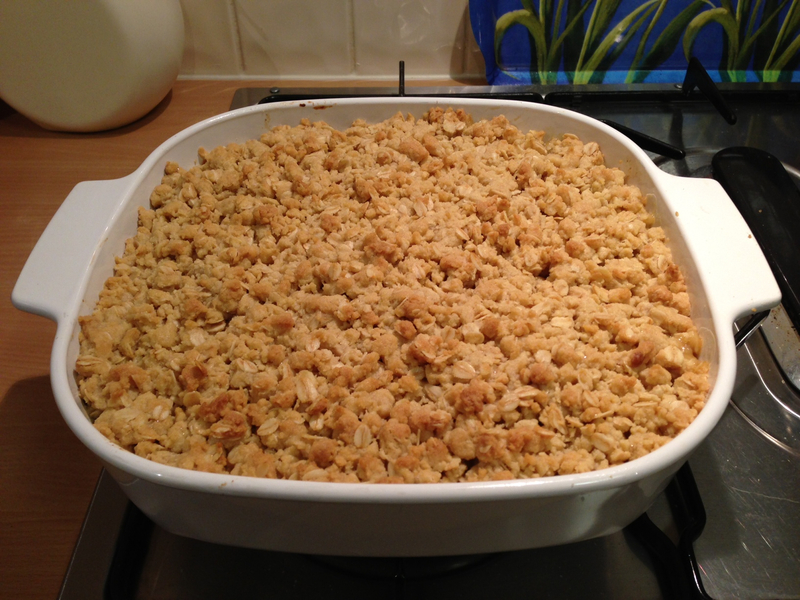 I feel almost as silly blogging about Apple Crumble as I did blogging about Honey Joys. It’s such a simple dessert to make, and there are tonnes of terrific recipes for it out there already. But for what it’s worth, here’s mine. When it comes to Apple Crumble, I’m a big believer in there needing to be as much crumble as there is fruit, that it should be crunchy and chewy all at once, and served with a spoonful of icecream. And in the middle of winter, how lovely is any dessert that has hot and cold elements in the same bowl? I can’t come at any recipes that call for butter to be rubbed into flour, so this one simply asks you to mix melted butter with the dry ingredients. Apple Crumble is so fast to make, and all the ingredients are easily stocked in the pantry, ready to go when needed. The recipe below serves 8-10 people, is quite fast to make, and costs around $9. Enjoy! Preheat oven to 180 degrees and place peaches and pie apple in a medium sized baking dish. Combine all other ingredients in a bowl and mix together until combined, but mixture should still consist of lots of little lumps. Spread lumpy mixture evenly over the apple and peaches in the roasting dish and bake for 25 minutes or until golden. Serve with icecream, cream or custard.